I haven't seen the movie and not sure I will. I really can't stand the Batman movies....just not a big comic book fan. I don't know if someone brought this up before but I wonder if Heath didn't die before this movie came out would he and the movie have garnered so much attention? I've read that this was his "best performance to date" and it was "oscar worthy". Is that because of his acting or because of his death that the media has jumped upon? Having seen the film (and having been very sceptical to it before I saw it, as you may recall), I'd say the film would certainly have garnered very wide attention and adulation no matter what. For a superhero movie it's definitely of decent quality. Not my particular cup of tea, what with the character development largely getting lost in endless car chases and explosions, and most of the characters not rising above their 2-D cartoonish origins. But there is no doubt the film is good enough, on its own premises and in its genre, to have merited positive reviews and a big box office no matter what. That said, the added poignancy of this being Heath's last finished film of course hasn't decreased the interest. But in my opinion, it has been one factor among many. At the end of the day, the film stands on its own two legs. As for Heath's performance in it, it is nothing less than astounding. I disagree that it is his best performance to date - that would still be Ennis, no mistake about that - but the Joker is an immense acting tour de force, that is indisputable. There really isn't much grounds on which to draw a comparison between Ennis and the Joker, they're that different and at opposite ends of the acting range. The main difference to me is that I can (and always will) relate to Ennis as a real person. With the Joker, for all his impact, I couldn't do that - he was a larger than life, utterly impressively acted cartoon figure. Not a real person, never a real person, but a riveting representation and symbol of everything we as individuals and as a society fear that goes bump in the night, everything that challenges our humanity. A symbol of the forces of chaos and anarchy, and their mysterious attraction and lure. He has such incredibly sinister presence and power and sheer frightening charisma in the role, he nearly burns through the movie canvas just from being present on screen, never mind the incessant explosions in the background. Whether the performance is Oscar-worthy.... well, I happen to have no respect fro the Oscars after 2006, so I don't know. That term is not my term for a good perfomance anymore. And the Joker is a unique performance. I don't think Heath's tragic and untimely death has changed my view of that one iota. I want to see him developed as Two-Face, but they killed him. Can they make another movie in which that just didn't happen? I'm not sure he was killed. After all, look how quickly he bounced back from having half his face burned off - look how that eye of his kept working just fine when you'd have expected it to dry up and shrivel. My point is that along with the rest of the characters, he clearly defied ordinary laws of what a human body can withstand and still keep going. So I'd say it's a fair bet Two-face survived. 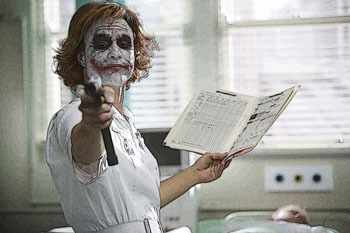 And what about the Joker, and what about Rachel Dawes? I'm fuzzy on what happened to both, and that was the intention of the filmmakers, I'm sure. Based on what we got in the film, both characters might very likely be intended to re-appear in a later film. (In terms of the script writing and the filming, the filmmakers still thought they'd have Heath on hand to do a sequel. The actors always are made to sign on to this kind of movie with a 2-sequel clause). One of my gripes with TDK was that it seemed so eager to set up sequels and therefore leave everyone's fate ambiguous and up in the air, there was no closure on anything at all. Alain Bielik concludes his two-part report on The Dark Knight with Double Negative, Framestore and Buf. In comic books, superheroes generally battle one villain at a time. But on the big screen, it seems that two major baddies are a minimum to satisfy audiences. The Dark Knight, now playing from Warner Bros., is no exception as Batman is opposed by the Joker (a haunting performance by the late Heath Ledger) and Harvey Two-Face (played by Aaron Eckhart). Both characters had already made an appearance in the Batman film saga. In 1989, Jack Nicholson portrayed an unforgettable Joker in Batman, wearing a striking make-up designed by Nick Dudman. In 1995, Tommy Lee Jones played Two-Face in the not-so-well received Batman Forever. The actor wore colorful make-up created by Rick Baker. This time, though, director Chris Nolan wanted a completely fresh approach. The Joker was realized via evocative facial paintwork associated with subtle prosthetics work. For Two-Face, Nolan decided to break new ground. "This character was one of our major vfx challenges," recalls overall Visual Effects Supervisor Nick Davis. "Chris was not interested in going the traditional make-up route. He felt that it would be an additive effect, rather than the subtractive effect that he felt the character required. So, instead of adding a layer of material to the actor's skin, we actually removed the skin digitally. It allowed us to reveal the tendons, the cheeks, the eyeballs and to create unique textures. The challenge here was that we were dealing with one of the main characters, and that the digital make-up would be seen in full close-up, including in dialogue scenes…"
Since the technique was introduced in such movies as Deep Rising and The Mummy, digital prosthetic make-up has become increasingly popular with directors looking for innovative character designs. The task to push it one step further on The Dark Knight was assigned to Framestore in London. In-house VFX Supervisor Tim Webber oversaw the project with VFX Producer Lorna Paterson, CG Supervisor Ben White and 2D Supervisor Jonathan Fawkner. The team used a variety of software, including Maya, XSI, Mudbox and in-house tools for modeling and animation, PRman for rendering, as well as Shake or Nuke for compositing. The all-important tracking and matchmove work was carried out in RealViz Matchmover and Movimento. What a great post, Mika! I felt like I was reading a noted film critic's review. Thanks for stating it so beautifully. It's Aaron Eckhardt - with a perfect face! . But in this scene, he is supposed to have half his face burned off. This is either a goof in the movie or a promo still. Fits to the reports that all the damage on his face was done via CGI. Different guy (?) in bed, and the Joker doesn't wear a medical mask. Which one is in the movie? I cannot stand this type of film normally.In fact it is the first one I have seen, since taking the kids to Spiderman. I am obviously a bit biased vis a vis Heath, but I do think for the genre, it is pretty good. I relied on my kids opinions and they are still raving about it now, 2 weeks afterwards. Now here's the interesting bit, apart from the batpod, the thing they are raving about is Heath.!!! I am now officially cool with my kids as they rate him so highly.In fact I was showing them bits of the HHH thread and even the oldest said "way cool he wears Vanns," a particular kind of very cool shoe I am reliably informed !!! I do not know about other viewers, but seeing TDK has acted as a catalyst for my kids and also some of my friends to go and see more Heath movies.So that just makes it even better in my book. Anything that encourages people to se more Heath films has to be a good thing. Back to TDK I can almost see through the film to an uneasy sense of twisted reality. How far are we really from anarchy in some parts of the world. 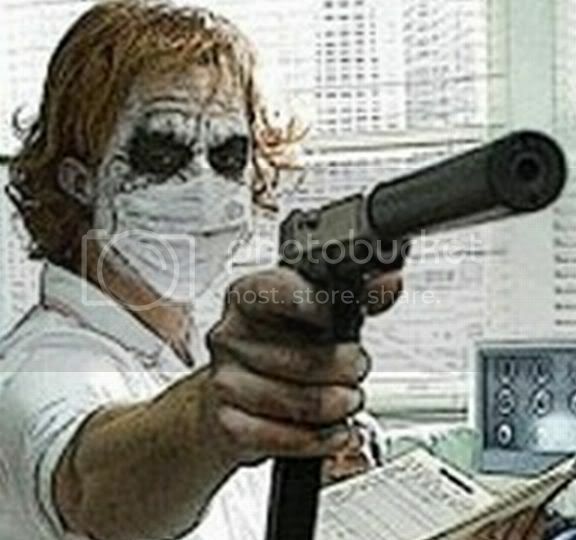 I know no one is running around wearing the jokers costume, acting as a sociopath.But we do have people, who to us wear strange/different garb and who are running around the world blowing up things, with very little regard for anyone or anything, other than their own, some would say twisted view of the world. Sometimes the truth is not so far removed from fiction. The Joker Serves a Good Purpose! Him: ...and I've just been to see TDK. Have you seen it? Me: Yes, I have. What did you think? Him: Well... didn't like it all that much, characters were not very interesting, bleak and too long, but OMG - The Joker!! - the film was worth seeing for the Joker alone! He was amazing, what a great role, lit up the screen (etc etc for some time.) What an actor this Heath Ledger was! Me: Yes, he's my favourite actor. And I very much agree about the Joker. Me: (so very helpful! ) Brokeback Mountain? Me: Oh, you've just got to see it. Heath's amazing in it, it's a wonderful film, one of the very best, story and acting alike entirely remarkable. High quality all the way. I don't know whether he'll actually get around to watching it, of course, but anyway - proof positive was had that the Joker makes people consider watching Heath's earlier roles, and BBM of course is high on the list due to the critical acclaim and the Oscar visibility. Re: The Joker Serves a Good Purpose! Thanks for that story, Mika. You had the perfect approach. Yes, we Brokies now have a new mission: setting the world straight about Heath, one potential Brokie at a time. That's the way forward.I have converted all my family to either Heath or BBM.My oldest and middle sons both very very surprisingly loved BBM.My oldest has in fact, due to a number of things become a real advocate for gays, and his most recent friend is gay.The younger son has always just accepted everyone in a completely non judgemental way.He thought BBM was very sad.Both the boys thought Heath in TDK was off the scale good. My daughter thinks he is very cute in AKT an 10 things, and I watched Casanova and Candy with my husband.He struggled to see how both films could be the same actor.He of course loved TDK. Heath has made a movie for everyone really.So my philosophy, is get people to watch one or two of them and then gently lead them by the nose to BBM !!!!!! Sort of carrot and stick approach, or is it more Pavlovian ?